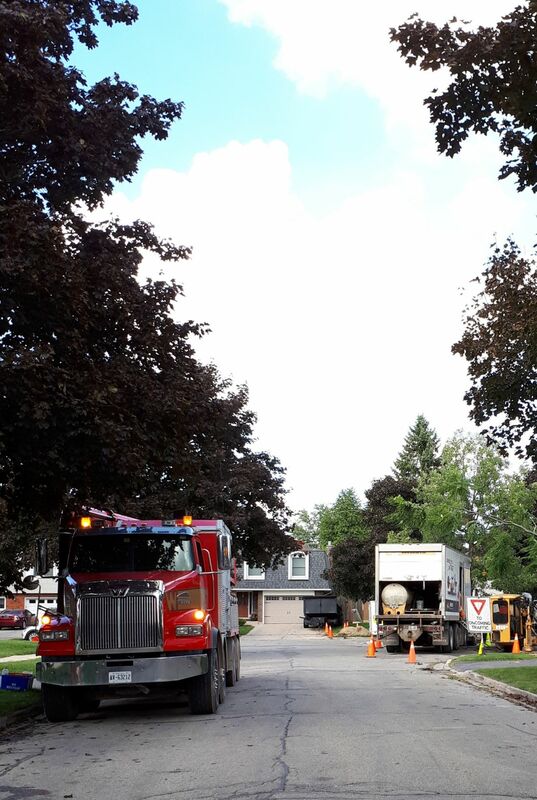 Construction is well underway in Stratford, and our crews are currently working north of Huron in the neighbourhood of John, Huntingdon, and Hibernia Streets. Fibre to the Home installs are happening throughout the winter months, and outside you may see us working in your neighbourhood on the municipal right-of-ways. We are completing pre-engineering work throughout the City of Stratford, to expedite the construction process once spring comes. Pre-engineering can involve any or all of the following activities: Locate markers (the yellow, pink, red, blue, green spray paint and/or flags you see on the ground), mapping, taking measurements. What’s the purpose of pre-engineering? Completing this work now will assist us and provide us with more of a jump-start once construction season arrives. What streets are you working on? We are working throughout the City of Stratford. You are likely to see us in several neighbourhoods over the next couple of weeks. What type of equipment is involved in pre-engineering work? You are likely to see us taking measurements, photos, locating utilities and using spray paint marks and flags to identify them. What should I do if I see you working near my property or street? Our pre-engineering work should not affect your property. We do encourage you to visit our Stratford office at 587 Huron Street, Unit 3 for more information about Wightman Fibre to the Home. It’s important that residents interested in Fibre to the Home sign up — we don’t want to miss your address. Installs are happening now. Signing up for Fibre will get your name and address on our list! While the weather is becoming more like winter, our construction crews are still working away! You’re likely to see our crews working in the area of Mornington Street and Waterloo Street North. Over the next week or so, our crews will be working south of Mornington Street along Elizabeth Street, William Street, Waterloo Street North, Hillcrest Drive, William Street, Haig Street, and surrounding areas. 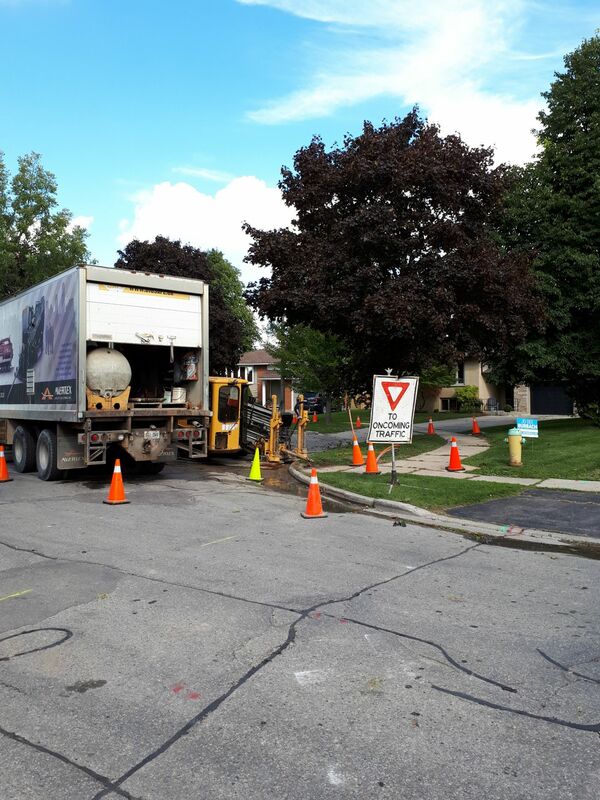 You’re likely to see our crews working across our 2018 construction area over the next couple of weeks, including the neighbourhoods of and around Hibernia Street, Huron Street, Glastonbury Crescent, Greenwood Drive, Mornington, Glendon Road, Delamere, and William Street. First step, the drill creates an underground bore path. Second step, the drill literally pulls our conduit back through the underground path (our conduit is the hollow piping you see on those huge reels around town). Third step, our Fibre to the Home lines get blown through the conduit! Over the next week or so, our crews will be working in the area of William Street, Mornington, James, and Waterloo Street North. Our crews are currently working in the neighbourhood of Kemp Crescent and Simpson Court, installing our facilities on Municipal property. As mentioned last week, we use the hydrovac method to vacuum dirt out of the area where we need to work, which helps to minimize surface digging and keep our construction as clean as possible (that’s the purpose of the large trucks with the cylinder-shaped body). Finally, we’re able to bury fibre from the curb to the exterior of all residences that have signed up for service. This is why it’s crucial that if you want Fibre to the Home, you contact us to let us know, as we will need your permission to bring fibre from the curb to your home. As you’ve likely noticed, we tend to move through neighbourhoods quite quickly! 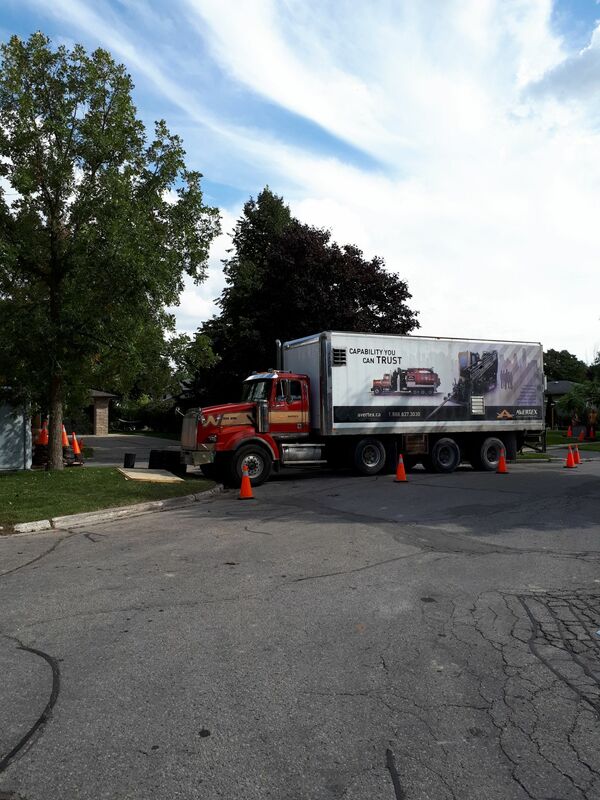 Our crews are working along Mornington Street, as well as in the neighbourhood of Graff Avenue and Kemp Crescent. Over the next several days, our work will be moving down to the neighbourhoods around Glendon Road and Dawson Street. Installs in Stratford have started! Sign up today so that your name and address are on our list! Over the next week, you’re likely to see our construction crews working in the areas of Bedford and Park Lane Drive, Kemp Crescent, and Graff Avenue. We’ll also have a drill in the Normandy Drive area as we continue to lay Fibre conduit on municipal property. Installs are happening now in Stratford, so just a friendly reminder that if you want Wightman Fibre to the Home service, you must sign up! We will not automatically bring Fibre to your location, so be sure your name and address are on our list! Visit us at 587 Huron Street Unit 3 (and yes, we are open Saturdays from 9AM-5PM!) Click here for a full list of our office hours. As technology continues to evolve, new methods of burying conduit do, too! Check out this video of our contract crew installing a drop conduit on a property in Stratford. Not only is it small (and therefore minimally invasive), this machine is operated with a remote control for greater maneuverability in small or congested job sites. The rubber tracks help to minimize any damage or disturbance to the ground, and the point where the conduit is buried appears virtually seamless. Today we’re talking about the sign up process for Wightman Fibre to the Home. There are some great reasons to sign up for Fibre to the Home now. If you sign up now, your price will be locked in based on our current prices. That could mean signing up today, you would lock in to our 2018 rates, even if you don't get connected until 2020. You will continue to enjoy the price through 2023. Signing up today also allows you to move your internet and/or phone service over to Wightman now, so you can start enjoying the Wightman experience. Knowing where the most interest is for Fibre to the Home also influences our Fibre design, especially in the 2019 and 2020 phases. Also, installation is free while construction is in your area. Construction is underway and Fibre to the Home installs are happening now in Stratford. It’s important that if you want Wightman Fibre brought to your location that you sign up so we can ensure that your name is on our list. Visit us: 587 Huron Street, Unit 3, Stratford (and yes, we are open Saturdays from 9AM-5PM!) Click here for a full list of our office hours. Over the next week or so, you’ll likely notice our contract company, Avertex, working along Mornington Street, as well as in the neighbourhood of Glastonbury and Coriano, and finishing up our work on Brett Street. With installs underway, our contract company, Avertex continues to along streets in our 2018 construction area, placing Wightman infrastructure on municipal property. You’re likely to see our crews over the next week working on Glastonbury, Nethercott, Coriano, and other streets in the area. Wightman Fibre to the Home installs are happening in Stratford! We’ve been laying the ground work for Wightman Fibre to the Home through construction activity for the past couple of months, and effective this week, we have started installing Fibre directly into the homes of people living in our 2018 construction area who have signed up for Wightman Fibre to the Home! This is a major milestone in our Fibre to the Home project timeline. Ever wonder what’s beneath one of our pedestals? (please don’t remove the lid!) Inside one of our pedestals is a complex network of wiring, from which we distribute our Wightman Fibre. Fun fact: All of Wightman’s pedestals are flush-to-grade! Over the next week or so, you’re likely to see our contract company, Avertex, working in the following neighbourhoods: Mornington Street between Graff Avenue and Hibernia Street, Glastonbury Drive and surrounding streets, Brittania, Charles, Caledonia, and Hibernia Streets, Graff Avenue, Glendon Road, and surrounding streets. Stay tuned next week for a very exciting announcement! A reminder that we will not automatically bring Fibre to your location: Interested homes and businesses must sign up (even if you’re already a Wightman customer). Our Fibre to the Home project involves us bringing a Fibre connection to each home and business that has signed up Fibre. To do this, first we must install and bury our fibre infrastructure in the street, then we must prepare the building called our Point of Presence (POP) where we keep the technology that enables us to deliver Fibre to the Home services, and then from there we are able to bring Fibre throughout surrounding neighbourhoods. In the coming weeks we will have more exciting news about how our project is moving along in Stratford! Now is the time to sign up for Fibre. In the next couple of weeks, you’re likely to see our contract company, Avertex, working in the neighbourhoods around Mornington Street between Graff Avenue and Hibernia Street. Homes and businesses that want Fibre installed need to sign up for service so that we don’t miss you when we go by. We’ve had a strong start to the month of July, with our contract company, Avertex, finishing work along McCarthy Road. Over the next week, look for us working in the neighbourhood of Deacon Street, Northway Circle, Dickens Place, and Hyde Road. We’re placing our infrastructure in the ground, which will enable us to bring Fibre to the Home to residents and businesses in the area! Now is the time to sign up for Wightman Fibre to the Home, to ensure that we include you in our construction plans! Homes and businesses that want to have Fibre installed at their location must sign up. or more information about Wightman Fibre to the Home in Stratford, visit wightman.ca/stratford or call 1-877-863-4273. You can also visit our Stratford location, 587 Huron Street, Unit 3, or email ftthstratford@wightman.ca and we will send you the details you need. Work continues on our Point of Presence (POP) at the corner of Greenwood Drive and McCarthy Road. As mentioned in our last update, this is a critical part of our Fibre to the Home project, as from our POP, we’re able to bring our Fibre to the Home connection directly into your home. 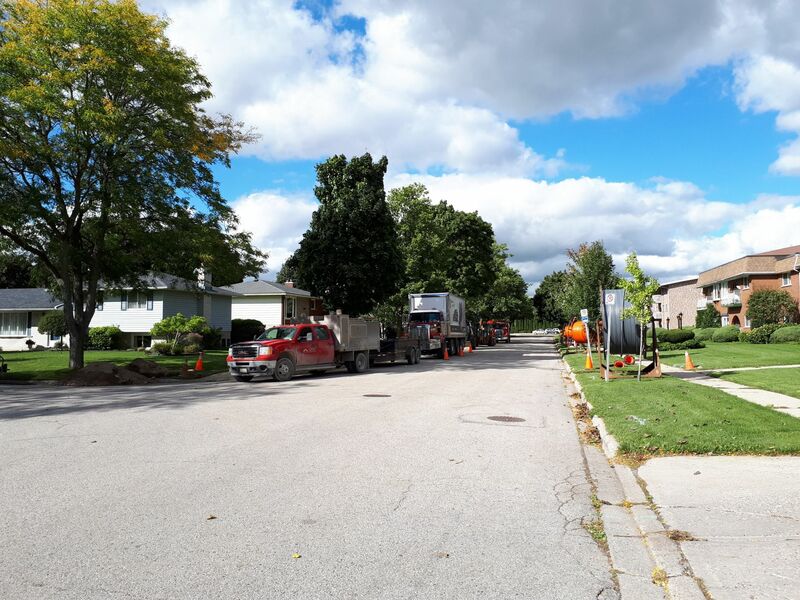 Our contract company, Avertex, continues to work in the Greenwood Drive, Norwood Court, Henry Drive area, installing Wightman facilities on municipal property. The large spools you see in the area are spools of conduit for our Fibre. More locates will be happening in the next couple of weeks as well as construction moves along. If you live in the Greenwood Drive neighbourhood and surrounding streets, we urge you to sign up for Wightman Fibre to the Home so we don’t miss your home when we go by. For more information about Wightman Fibre to the Home in Stratford, visit wightman.ca/stratford or call 1-877-863-4273. You can also visit our Stratford location, 587 Huron Street, Unit 3, or email ftthstratford@wightman.ca and we will send you the details you need to sign up. We continue to work on our Point of Presence (POP) at the corner of Greenwood Drive and McCarthy Road. This is a critical part of our Fibre to the Home project. Our contract company, Avertex, is working in the Greenwood Drive neighbourhood, installing Wightman facilities on municipal property. The large spools you see in the area are spools of conduit for our Fibre. Reminder: We will not automatically bring fibre into your building. Homes and businesses who want Wightman Fibre service must sign up. Work on our Point Of Presence site at the corner of Greenwood Drive and McCarthy Road continues, and if you’re in the area you’re likely to see spools of conduit, pylons, and even one of our drills. Our contract company, Avertex, continues their work along Greenwood Drive installing Wightman facilities on municipal property. 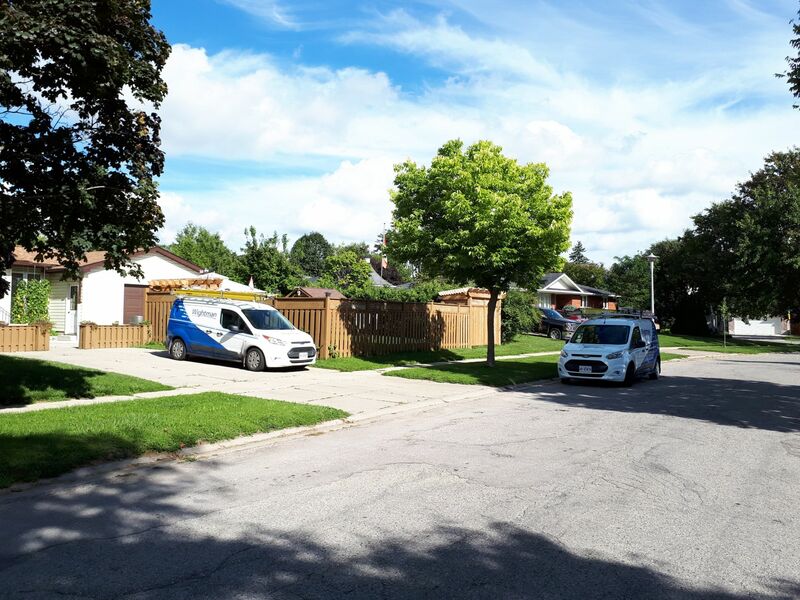 If you live in the neighbourhood of Greenwood Drive and the surrounding streets, we urge you to sign up for Wightman Fibre to the Home so we don’t miss your home when we go by. For more information about Wightman Fibre to the Home in Stratford, visit wightman.ca/stratford or call 1-877-863-4273. You can also visit our Stratford location in the Sobey’s plaza, 587 Huron Street or email ftthstratford@wightman.ca and we will send you the details you need to sign up. Reminder: We will not automatically bring fibre into your building. Homes and businesses who want Wightman Fibre service must sign up. You’ve likely noticed the work happening east of the Rotary Complex! Our contract company, Avertex, has a drill working along Greenwood Drive installing Wightman facilities on municipal property. Make sure we don't miss installing fibre to your home or business! For more information about Wightman Fibre to the Home in Stratford, visit wightman.ca/stratford or call 1-877-863-4273. Reminder: We will not automatically bring fibre into your building. Homes and businesses who want Wightman Fibre service must sign up. Make sure we don't miss installing fibre to your home or business! Head to our Stratford store at 587 Huron St. Unit 3 and sign up! Our contract company, Avertex, is working in the area to place Wightman facilities on municipal property. Stay tuned for more updates on this exciting project as we work to make Fibre to the Home available to residents and businesses in Stratford! For more information about Wightman Fibre to the Home in Stratford, visit wightman.ca/stratford or call 1-877-863-4273. Reminder: We will not automatically bring fibre into your building. Homes and businesses who want Wightman Fibre service must sign up. Learn more about our Fibre to the Home project in Stratford. Locates have started (small lawn flags and marks), and residents will see Avertex (our contract company) vehicles working in the area May 21 or before. Avertex will be working to place Wightman facilities on municipal property. Stay tuned for more updates on this exciting project as we work to make Fibre to the Home available to residents and businesses in Stratford! For more information about Wightman Fibre to the Home in Stratford, visit wightman.ca/stratford or call 1-877-863-4273. Reminder: We will not automatically bring fibre to your location. Homes and businesses who want Wightman Fibre service must sign up. On March 22, 2018 our contracting crew was completing the drop installation into our new Wightman Stratford store at 587 Huron St. Unit 3!